Sit back and relax or move around while icing sore muscles and joints—use a reusable, stick-on cold pack. A medical-grade, non-toxic nanogel lets this cold pack comfortably stick to your skin without irritating it or pulling out hair. Place the cover over the gel patch after each use and it can be reused again and again. Capacity (each): 2.2 fl. oz. Dimensions (each): 2.88" diameter x 0.29"
The best thing is how this ice pack sticks to your skin. No more holding or propping up against something! Love my paincakes! I use on my wrist-thumb joint, thank you. For small injuries, this is the perfect size. I love how it forms to the body-part. With a stick-on ice pack, you can give sore muscles and joints relief without needing to sit still. 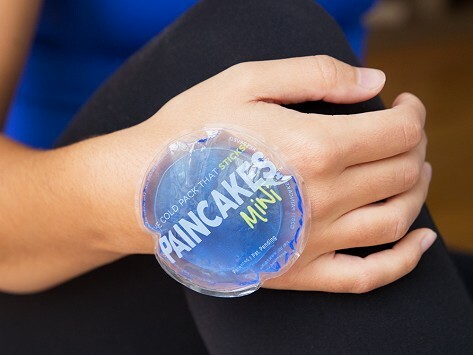 PAINCAKES have a reusable adhesive that won’t irritate your skin or pull out hair. And these tag-along ice packs are Made in the USA. With a medical-grade, non-toxic nanogel patch, PAINCAKES comfortably adhere to an ankle, knee, or shoulder and stay there. Unlike disposable stick-on cold packs, these are made to reuse over 100 times. Just place the cover on the gel patch after each use. Put one in the freezer and it’ll cool in 30 minutes, which is conveniently the recommended waiting time between cold therapy sessions. If you want your PAINCAKES to be even colder, leave them in the freezer for up to 2 hours. Stick one on dry skin, then sit back or get up and move around. Wherever you go, this clingy soreness soother is going with you.